It’s been said that email marketing can offer a return of $32 for every $1 spent. That certainly paints a lucrative picture while making you wonder why everybody running a business isn’t a multi-billionaire. Well, the reason we don’t live in some entrepreneurial utopia is really quite simple; the numbers don’t tell the entire story. Yes – when done the right way – email marketing campaigns will drive conversions and offer a return beyond your wildest dreams. Unfortunately, many well-intentioned marketers execute these campaigns the wrong way, making cardinal mistakes that land marketing efforts in recipients’ trash bins. As marketing enthusiasts, it brings tears of sadness to our eyes when the powerful potential of email marketing isn’t fully realized. Especially when many emailing missteps are avoidable. In fact, there are 10 mistakes that happen far too often when businesses like yours try their hand at the email marketing game. 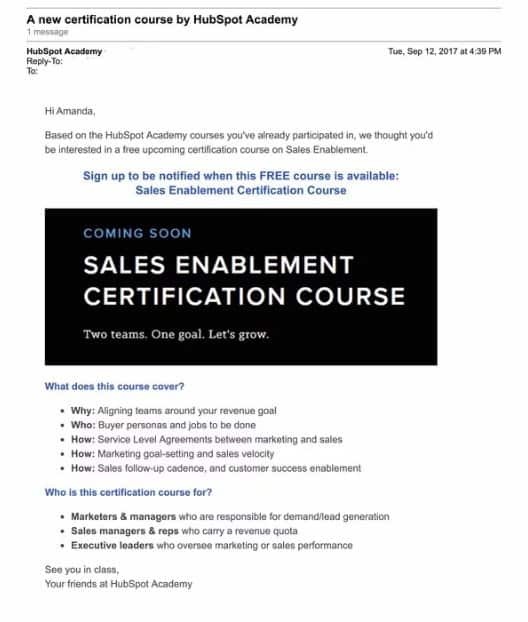 Read below for a deep dive into these clunky email marketing misfires so they can be avoided. There’s a harsh truth every email marketer must accept. People, for the most part, enjoy reading promotional material about as much as they enjoy falling from a 5-story building. Furthermore, inboxes have been a prevalent part of society since the late 90s, meaning everybody is familiar with marketing emails. More specifically, they’re familiar with ignoring marketing emails. And your target’s email-opening stinginess starts at the very beginning. Recipients are ruthless, callous, and unforgiving when faced with a flat subject line. 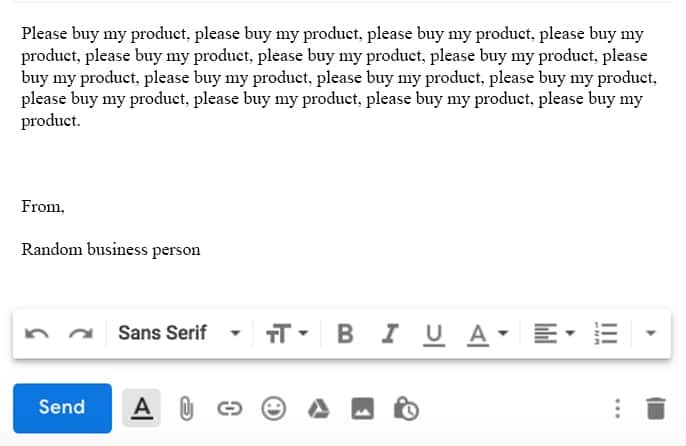 A lifeless opening line will lead to your email’s premature demise. So, you must be engaging and conversational. Maybe even ask a question. …write a subject line like this…. Marketing email analytics are crucial to the success of campaigns. They don’t just show what’s working, they also show what isn’t working. There are times when small business owners tighten their financial belts to the point of outright suffocation. Commonly, this will stifle your ability to expand. It’s a tough balancing act but there are times when increasing your marketing budget can really pay dividends. As the old saying goes: you have to spend money to make money. Surprisingly, that’s not a conspiracy concocted by Wal-Mart, McDonald’s, and Apple to encourage extravagant purchasing. It’s downright wisdom. Without spending on email marketing software, your campaigns will be akin to chopping down a tree with nothing but your bare hands. Not only do these various services track results, but they can also create engaging email templates, manage contacts, segment users into groups, and perform much-needed list hygiene. Even with a tight budget and limited know-how, there are services out there starting at $10 a month. At worst, that’s worth the amount of time it would save you. All it takes is listening to Elon Musk rant about artificial intelligence to become skeptical about the authenticity of, well, anything and everything. Nowadays, it really seems like the bots are taking over. Yes, we’ll admit that the idea of owning a robot butler is enticing. However, perceptions of bot-written messages haven’t been great for email marketers. Most recipients think they’re receiving a generic, impersonal communication sent by an uncaring bot. Not a passionate, hot-blooded human such as yourself looking to achieve the American dream. Why? Because these particular emails aren’t personalized. Personalized emails have approximately 6% higher open rates than non-personalized emails. Here’s where the aforementioned email marketing software becomes clutch. While sending an individual email to 100s if not 100s of thousands is impossible, that doesn’t mean each email can’t be personalized. With software, groups can be segmented so separate emails can be templated and catered towards the various target demographics of your consumer base. The level of personalization seen in this email from Spotify is deeply layered, tracking the recipient’s listening habits then rewarding them for using the product by offering an exclusive pre-sale for tickets. Spotify’s email offers something of value to the recipient. Yet, many email marketing efforts aren’t accompanied by a valuable offer. Similar to luring bees without honey or attracting a Kardashian without money, this is a futile effort. If you’re sending a newsletter, try sending subscribers helpful tips accompanied with a link to a podcast or an article (outside of your own content) that you’ve found helpful. Your recipients want emails that provide something more than a pushy sales pitch. Although it’s your own blog, you’re still providing subscribers with something of value they can use in their everyday life – without having to purchase a product or service. In the above example, because there’s valuable information for content writers, Express Writers establishes itself as an industry expert. As a result, subscribers will indirectly be more invested in the product because the brand has established goodwill with the altruistic offering of their free blog. Even if you use an enticing subject line, state-of-the-art automated software, personalized messaging, and a value proposition, your email campaign can still go kaput. How? With poorly timed emails. It’s like spending hours slaving away on a succulent roasted pig – only to serve it when everybody’s already gone to bed. Analytics are also integral here (noticing a pattern?) because tracking open-rates at various times will provide valuable insights. Start by sending emails at one time, like 9 on Thursdays, for a few months. Then, switch to another time for a few months and compare the respective results. Overall, it’s been reported that the best times to send emails are 6am, 10am, 2pm, and 8pm. 80% of deals need five touches or more before closing. Those numbers are as staggering as Jeff Goldblum’s immutable charm. The math is simple. By failing to send follow-up emails, you won’t be giving yourself the chance to succeed. Yet, 70% of sales emails don’t make it past the first attempt. This means the majority of marketers don’t prescribe to the notion of persistence paying off. A huge mistake. Your email subscribers and recipients share a lot in common with Goldilocks. To satisfy their discriminating tastes, the frequency at which you deliver your marketing messages must be just right. Assaulting recipients with an array of weekly (or even daily) emails is one sure-fire way for the “unsubscribe” button to see an abundance of action. 69% of users unsubscribe due to receiving too many emails. There’s a fine line between consistency and spam. And there’s a proverbial “sweet spot” that your campaigns must find to ensure the best possible results. There are many factors impacting how frequent your marketing emails should be sent, such as the product or service and the nature of the emails. If you are regularly changing offers, sending out email blasts 2-3 times can work. But if the emails are more of a broad newsletter, twice a month might be better. Those new to email marketing might think it’s simply a matter of crafting a well-written message and hitting the send button. They forget that a picture says a thousand words. The fact is, the average person doesn’t like plain text. And, according to 3M, the brain processes visuals 60,000x faster to visuals than just words. What’s more, is people will spend 10% more time looking at visual content than reading plain text. With only text, your subscribers will feel like they’ve been sent a long-winded essay from their old university professor instead of being granted access to your latest and greatest offers. Plus, bland text-only marketing emails are unprofessional. What does it say about a business when it won’t take the time to establish a signature look? Not sure where to start? Any email marketing software worth its salt has a multitude of eye-catching design templates. If the standard email template works for your business, simply adding a picture of a meme, gif, or thumbnail with a link will go a long way in engaging the reader. All the design prowess in the world is about as valuable as a kick in the pants if it’s not optimized for mobile devices. In 2018, 52.2% of all worldwide online traffic was generated through mobile phones. Further research claims that 65% of email is opened via mobile devices. Meaning, those failing to optimize for mobile aren’t reaching the majority of online traffic. Interestingly enough, although images and designs are important for memorable and engaging emails, going too far with them can hurt the mobile experience due to slow loading times and a lack of scrolling efficiency. Utilize responsive mobile templates designed to fit phone screens. Be smart with words in the subject line; an iPhone displays only the first 30 or so characters of a subject line when the device is held vertically. Buttons are better for calls-to-action than links because they’re easier to click. Speaking of calls-to-action (CTAs)—not using one is going to generate as many results as paying off your mortgage with Monopoly Money. The CTA is the next step in the process where the recipient is helpfully directed to a landing page, product page, or blog, etc. Otherwise, what’s the point of the email? Simply to say hello? To try out your new stand-up comedy material? There needs to be a method to the madness. Your CTA is that very method. As has been discussed, buttons are generally better for CTA’s compared to links. For one, the resulting mobile optimization is invaluable, but secondly, buttons pop better visually than links. CTA buttons should contain text that is large, legible, short, concise, action-oriented, urgent, and in the first-person. Feeling argumentative and need more proof that CTAs are essential to email marketing? Wordstream reports that emails with a single call-to-action increased clicks 371% and sales 1617% compared to those without a CTA. Email marketing is particularly awesome because even if you make the above mistakes, it won’t cost much money in the long run. Whereas an ill-conceived billboard, a poorly budgeted Google Ad, or splurging for an ineffectual television spot can all put a business in dire financial straits. These types of marketing strategies are highly expensive and require immediate results for anything resembling a decent return. Such immense marketing spend is like going to Vegas without any of the good times and debauchery. Just the stress of hoping your gamble pays off. Conversely, email marketing is inexpensive and gives businesses the breathing room needed to improve and nuance their messaging. Like going to Vegas but with nothing but house money, so to speak. Thankfully, while developing your craft as an email marketer, there are helpful blogs with savvy insights and tips that’ll help you along the way!